The Special Meeting of the Harford Township Supervisors was called to order by Chairman Terry VanGorden at 7:00PM in the Township office. The purpose of this special meeting was for the purpose of passing the 2012 budget and general purposes. Visitors were Ted Brewster, Doug Phelps, and Maureen Warren. In reviewing the records of 2010, it is noted that a motion passed at the December 14, 2010, meeting was incorrectly recorded. The minutes should read “ Furney made a motion to accept Resolution 5-10 for the tax millage levy for 2011. General millage stays as last year at 4.13 (not 5.13) and Fire Protection also stays as last year at 1 mill”. Resolution 4-11 for Peoples Neighborhood Bank loan for the 5500 Dodge Ram was presented. Motion made by Foltz and seconded by Furney to approve Resolution 4-11 for the loan of $40,000.00 for three years at 3.5% interest. Motion carried by three yes votes. Resolution 5-11 to allow Harford Township to raise the sewer rated to the users by $3.00 per EDU per month, equaling $114.00 per EDU per quarter. New rate will start for the second quarter of 2012. Motion by Foltz, seconded by VanGorden to approve Resolution 5-11. Motion carried by three yes votes. The 2012 budget as prepared and proposed at the Special Meeting of November 22, 2011, was reviewed. After a discussion, Foltz made revisions to the township portion of the budget. He reduced the raise in the millage to ½ mill and eliminated the fourth employee from the expenditures. Revenue now is $345,441.00 and the expenditure $324, 151.00 cash on hand December 31, 2012, as $161.290.00 which reflects $81,000.00 gas lease money. Foltz then made the motion to adopt Harford Township 2012 Budget to show the revised figures reflecting ½ mill tax raise. VanGorden made a second. Motion passed two yes votes, with Furney abstaining. Foltz made a motion to accept Resolution 6-11 for 2012 tax millage to be set at 4.63 from 4.13. Fire Protection millage will stay the same at 1 mill. VanGorden made a second. Motion carried by two yes, Furney abstaining. Applications for the operator/laborer position have been reviewed and screened with interviews being held with three applicants. Foltz made a motion to hire George Sansky, of 1262 ST. RT. 848, Harford Township, New Milford. Furney seconded and motion carried by three yes votes. An Executive Session for the purpose of personnel was held the evening of December 14th. And another one is to be held December 22nd for legal purposes with our Solicitor. The Special Meeting of the Harford Township Supervisors was called to order at 7:00 PM by Chairman Terry VanGorden. Supervisors Foltz and Furney were present also visitors of Doug Phelps and Ted Brewster. The purpose of tonight’s meeting was to propose the Township’s 2012 Budgets. Workshops have been held to review past figures and propose the revenue and expenditures for 2012. Foltz made a motion to propose a $3.00 a month per EDU raise in the sewer rates to the customs and also proposed the budget to be --- Cash on hand January 1, 2012 - $87,800.00, 2012 Revenue - $112,800.00, 2012 Expenditures - $154,606.00, leaving cash on hand December 31, 2012 at $45,994.00. A second was made by Furney and motion carried by three yes votes. Furney made the motion to propose the township budget as- cash on hand January 1, 2012- $140,000.00 (this includes gas lease money from 2010); 2012 Revenue- $360,941.00; 2012 Expenditures - $357,264.00 and cash on hand December 31, 2012- $143,665.00. The revenue figure reflex a one mill raise in real estate tax for the township. Motion seconded by Foltz and so carried by three yes votes. Furney made a motion to propose the state budget as –cash on hand January 1, 2012, - $73,400.00; 2012 Revenue - $180,846.00; Expenditure- $196,500.00; and cash on hand December 31, 2012- $143,665.00. Second made by Foltz and so carried by three yes votes. The Budget will now be advertised for public inspection with final consideration being made on a special meeting on December 21, 2011. The specification for a new Ford 550 truck were reviewed. VanGorden will do some calling to determine the cost and availability. It is felt that $25,000.00 from the gas lease money will be used for the down payment. Banks will be called for interest rates for four to five year loans. Chairman Terry VanGorden called the regular monthly meeting of the Harford Township Supervisors to order at 7:00 PM to order in the township office. All Supervisors were present along with visitors Ted Brewster, Doug Phelps, Pat Farnelli, and Eric Allen. The minutes of the October 11th meeting had one typing error and it was corrected. Foltz motioned to accept the minutes as printed with the correction. Furney seconded and motion passed by three yes votes. The bill list was reviewed. Motion by Foltz to approve as printed, VanGorden made a second. Motion carried by two yes votes. Furney voting no. The treasurer’s report was reviewed and filed for audit. A question was asked about some bills among them one from Home Services and Foltz responded that the 550 needed patch work on the box before it would pass inspection. The metal needed could not be found anywhere and had to be made and he purchased the material and helped put it on the 550. Thus the bill. VanGorden announced the FEMA deadline for residents to report any damage has been extended to December 14th. Mr. Michael Armiak of Bluestone Gathering pipeline was present to inquire about the road agreement that was left last month. The Board favors the road agreement already in place with Southwestern and recommends Bluestone to adopt a similar one. Mr. Armiak already has a copy and will get back with the Board. A Township Agent is needed for FEMA’s Hurricane Irene and Tropical Storm Lee disasters. Foltz motioned to pass Resolutions 2-11 and 3-11 to designated Sue Furney agent. VanGorden seconded and motion passed by three yes votes. Two subdivisions were reviewed – Schermerhorn and Lepre/MaGraw – were reviewed. There were no objections and the Municipality Report Forms were signed. Assessment permit for Nelson Warren for a garage was approved. Under Act 32, Central Tax Bureau of PA has been designated as the earned income collector the County. The Agreement was signed on a motion by Foltz, seconded by Furney. So carried by three yes votes. The apartment house known locally as the Tin Shop is malfunctioning. Engineer David Klepaldo has requested that the basin and pump be replaced. After a discussion, the Board approved and replacements will be ordered. The grates at the plant are in need of replacement and Foltz will look into the measurements and order the replacements. Valves are also needed and we will see if a local machine shop can make replacements. VanGorden asked that a decision be made as to the type of anti-skid to purchase. The number 67s type materials have been used the past couple of years and Foltz favors staying with them. VanGorden feels as they are larger it is harder on the equipment – spreader spinners, augers etc. Furney reported that several residents have complained about the larger 67s as causing flat tires and cracked windshields. Also discussed was the purchasing of black cinders to mix with the anti-skid. After debating the issue, Foltz commented make a decision and order them. Workshops for budget preparation ware set and a special meeting will be held November 22, 2011, to publicly propose the 2012 budget. Then a special meeting will be held on December 21, 2011, to pass the budget. The GP11 permit for the Stearns Road replacement pipe has been received from Engineer Todd Schmidt for Fox Engineering. Foltz motioned to approve the application and have it submitted with the necessary paperwork to DEP by Fox Engineering. VanGorden made the second and motion passed by three yes votes. The website is looking and good and it was agreed to pay David Oakley $500.00 a payment for this year’s work. Future maintenance and updates will be at $640.00 yearly rate to be paid semi-annually (June and December) unless something extremely unusual comes up. An Executive Session will be held immediately after the close of the regular meeting for personal issue of reviewing the applications. Chairman Terry VanGorden called the meeting of the Harford Township Supervisors to order at 7:00 PM in the township office. Supervisors Furney and Foltz were present. Visitors were Ted Brewster, Maureen Warren, Dorothy Hagenbuch, Joseph Hefele, Jerry George, Joe Elliot, Doug Phelps, Eric Allen, Pat Farnelli, and Gerry Yushinsky. The minutes of September 13th were reviewed and accepted as printed on motion by Foltz, second by Furney. Motion carried by three yes votes. Bill list was approved as presented on motion by Foltz, second by Furney and carried by three yes votes. ; Treasurer’s report was filed for audit. Joe Elliot, representative for Western Land Services and Jerry George, Williams Field Services Company, were present to discuss road use and temporary driveway access road, and underground utility road crossing agreements. They provided samples of these agreements they are using in other townships. The Board will review their samples and compare them to others that we have on file. The driveway permit application of Cabot Oil & Gas Corp. for the Zupp property on Pennay Hill Road was presented. Foltz has inspected the site that is marked for the driveway and they have been given the go ahead. Richardson Road project- Work is scheduled to start October 17th (weather permitting). The road will be closed during the road work. Fire Company member’s ordinance is still being reviewed by our attorney. A subdivision has been received from the County Planning for Holli Chichester, Keith Allen and Steven Allen on Tingley Lake Road. The site in questions will be served by the sewer system and the driveway has been addressed by the State. No objections from the Board. The 2012 agreements with the Harford Volunteer Fire Company were signed. Taxes collected so far this year are listed on the bill list and will be turned over to the Fire Company along with the Fire Relief Funds received from the State. A FEMA informational meeting for Hurricane Irene and Tropical Storm Lee will be held tomorrow at the Fire Hall. Furney and VanGorden plan to attend one of the two meetings. VanGorden announced that it is his intentions to retire by the end of the year. Therefore, we need to advertise for an employee. The position will be operator/laborer and applicants must have a CDL license. Advertising was discussed and the applications are due to the township by November 7, 2011. The Liberty Truck Center basin and pump replacement project is waiting for the contractor’s estimate. Dave Klepadlo and Joe Sheposh have asked that two hydromatic pumps be purchased from Benton Sewer Authority to have on hand for emergency repairs when needed. The Board have approval. Dave also would like to place a call to Mike Angerson from Rural Development to inquire about grants or low interest loans for the plant improvements and upgrades. No objections from the Board. VanGorden reported that White Road has been worked. He negotiated a price with Lopek Quarries for any rock for $5.00. Our trucks will do the hauling as tri-axles will not be able to get up the hill on the road. The materials are not state certified so the expenses will have to be paid from the township account. The budget will need to have adjustments. R3 rock and 2A stone were used and hopefully the only resident on the road will be satisfied. Richardson Road project has the contractor lined up to dig and place the pipe, compact materials, place head and tail walls and place the gabion stone. The Conservation office has been notified of the start date. Section I across Route 81 was worked last. It is felt that it is too late in the season to apply dust control oils as the snow plows will tear it up soon. Foltz reported that since L.S. Lopke moved into the O’Dell Quarry on Plank Road they have been running equipment 24 hours a day 7 days a week. The owners have been sent a copy of our Noise Ordinance #42 and their representative has talked to VanGorden and Foltz and agreed to work with us. But the noise has not stopped and they are still running backup alarms and crushers at night. Foltz said that we have done our part and now if someone files a complaint we will have to pursue. Foltz again referred to the time clock issue as reported on the Auditor’s report. He motioned that Harford Township purchase a time clock to properly justify times. VanGorden responded that he has talked to lawyers on the issue and feels that something could come back against him as he is verifying the times and he seconded the motion. Motion carried by two yes votes, Furney voting no. Paving has been done on School Street and the Board would like to acknowledge that residents Joseph and Mallory Phelan have donated $500.00 as they had offered. The Board wished to Thank Mr. and Mrs. Phelan for their contribution towards the project. Foltz asked for an Executive Session immediately following the regular meeting for an employee issue. The regular monthly meeting of the Harford Township Supervisors was called to order by Terry VanGorden, Chairman, at 7:00 PM in the township’s office. Supervisors Furney and Foltz were present also visitors were Dorothy Hagenbuch, Maureen Warren, Ted Brewster, Doug Phelps, Doug Garrett and Pat Farrelli. It was announced that an Executive Session for legal purposes was held on August 18, 2011. The minutes for the meeting of August 9th were approved as printed on a motion by Foltz and second by Furney. So carried by three yes votes. Tonight’s bill list was approved as presented on motion by Foltz, second by Furney and carried by three yes votes. Treasurer’s report was filed for audit. The School Street paving project is now completed. Contour Paving returned and blended in the driveways that were of concern. No further information from our Attorney has been received for the Property Maintenance Code or the Fire Company member ordinance. A Declaration of Disaster Emergency was declared on August 28, 2011, for Hurricane Irene and another one was declared on September 08, 2011, for the heavy rain from Tropical Storm Lee. Doug Garrett, Project Manager for Cougar Land Services was present to ask the Board for permission to use township roads for general property access and placement of wireless receivers for conducting a geophysical survey in Harford Township. The Board agreed and signed the permission agreement. The Blue Cross agreements for October 1, 2011 to September 31, 2012, have been received. There is a small increase in the PPO plan and a decrease in the EPO plan. The Board agreed to continue the employee’s coverage as it now stands. The Township coordinated with the Fire Company during Hurricane Irene with the removal of downed trees. Between the two, fifty-three trees were cut up and removed from the roads on Sunday August 28th. Working roads to finish up the yearly maintenance. The regular monthly meeting of the Harford Township Supervisors was called to order at 7:00 PM in the township office by Chairman Terry VanGorden. Supervisors Furney and Foltz were present along with visitors, Ted Brewster, Doug Phelps, Dorothy Hagenbuch, and Gerry Yuskinsky. The minutes of July 12th were approved by Foltz with one correction in the pipe size. Motion seconded by Furney and carried by three yes votes. The bill list was approved as presented on motion by Foltz, second by Furney and carried by three yes votes. Treasurer’s report was filed for audit. School St. Project – Contour Paving has paved the street and as time permits the crew will be finishing the sides. Houlihan Road – Southwestern has completed their work and closed the road for only a half day. They will be running their water pipe in our right of way. Property Maintenance Code – Furney has spoken with COG and have sent a sample ordinance for review. This will be sent to Attorney Hailstone for his review. The ordinance for fire company member coverage still needs discussion with Attorney Hailstone. This year’s cleanup had forty-seven loads @ $50.00 with dumpster expenses at $2,054.85. County Planning has sent a sub-division for Roland & Nancy Decker on Stephens Road. The lot three has an existing driveway and if it was to be developed the lot could be served by the township’s sewer line. Cabot Gas & Oil sent a driveway application for Pennay Hill Road at the Zupp property. VanGorden will be inspecting the site. Also sent was a noise waiver that was approved by the Board. Work is being done on Lower Podunk at present. Pipes will be replaced tomorrow. There is a four ton limit bridge on Lower Podunk that is being used by parties with more than the ton limit. There was a discussion as to who would be responsible if the case of damage or accident at the bridge. Furney will contact the state police for more information. Wilkins Road, a short road off Pennay Hill Rd., needs work and our equipment is not suitable for the work. Frank Payne will work the road and made it passable with his dozer for between $1000.00 and $1500.00. After a discussion, VanGorden will give Frank Payne the go ahead to do the work as discussed. No materials or township equipment will be used. White Road needs to be worked so the only resident can get into his cabin. Foltz has spoken with the resident several times. This road too is too narrow for the grader and our trucks to properly work it. Foltz said he can get a skidsteer, operator and fuel for $45.00/hr to go in and made the road passable. Estimated time is 10 to 20 hours for that work. Then the township will take out material to be spread. Permission given to Foltz by the Board to contact his party. VanGorden asked the Board for permission to order more 2RC stone than was budgeted. It was agreed that he can go up to the bid amount of 5000 tons. There was a discussion as to the type of antiskid and black cinders to be used this winter. VanGorden and Furney favor the smaller antiskid and mix it with the cinders. Foltz favors the #67s that have been used the last couple of years. No decision made tonight. Foltz will sign us up to the PennDot website for equipment sales and the on line bidding. VanGorden turned over specs for a 550 replacement. Foltz will review. The heater has been replaced at the plant and the louvers repaired. The monthly meeting of the Harford Township Supervisors was called to order by Chairman Terry VanGorden at 7:00PM in the township office with Supervisors Furney and Foltz also present. Signed - in visitors were Pat Farnelli (Susq. Co. Independent press), Ted Brewster (Transcript press), Paulette Adams and Maureen Warren. Motion was made by Foltz to accept June 14th minutes as printed, seconded by Furney and carried by three yes votes. Bill list for tonight was approved for payment on a motion by Foltz, seconded by Furney and carried by three yes votes. Treasurer’s report was reviewed and filed for audit. School St. project – Supervisors met with a representative from Contour Paving to discuss the project. The bid turned in was for $53,000 for preparing and paving School St. at a width of 18 feet. After a discussion with Contour Paving it was decided to reduce the width to 16 feet and closing the road during the work to save money. Contour has sent a new proposal for $47,000. Foltz made the motion to accept the changes and new proposal at the agreed upon cost and add that the work not to exceed 10 business days. VanGorden made a second and motion carried by three yes votes. Dilapidated barn on Tingley Lake Road - Our Nuisance ordinance #6 was sent to Attorney Hailstone for review and his answer has been received. He states that the ordinance would be difficult to enforce and we should not use this ordinance for the purpose of citing the owner of the barn to have it removed. He suggests enacting a Property Maintenance Code would be better. After a discussion, no action was taken at this time. Attorney Hailstone also reviewed the sample ordinance to cover fire company members involved in fund raising event for insurance coverage. He feels the sample is too vague. We will contact him for further discussion. Website - payment for services has been discussed and on a motion by Foltz a particle payment of $1000 will be sent to David Oakley for work that has been done and continuing work to be done on the website. A yearly maintenance will be determined later. Second made by VanGorden and motion carried by three yes votes. Assessment for a pavilion for Joseph Mac Connell at Dream was presented and there were no objections. Cabot Oil & Gas has applied for a driveway permit for Stockinger Road. They will clear, build up, and widen the end at the intersection with a private road of Jeffer’s Farms. The application was approved with the exception that the pipe if needed must be 15 feet instead of 12 as stated in the application. Also approved and signed was the application for a noise waiver for the period of a year for the drilling process. The heater replacement has been ordered and will be installed later. Also cost for the new E-1 duplex basin and pumps has been received from Site Specifics Designs, the company that has been supplying our pumps. Foltz would like to investigate other companies for their prices. The major portion of Section 2 is done and the crew is now working in Section 3. AEP oil is being spread on the roads after enough miles have been worked. Asphalt Paving was award the bid for the oil but has not responded to phone calls for delivery. The salesman who represented them at the time of bidding is no longer working for them and could not help us. The second bidder that was accepted at the time of awarding was Suit-Kote and they have been happy to supply and spread the oil this year. Foltz received a letter from a Harford resident complaining of trash burning in town. It appeared to be plastics that were being burned. No action was taken tonight. Southwest Energy has asked permission to again close a portion of Houlihan Road for further testing for a water line. Road would be closed for a period of time not to exceed five days. Permission was given. Pictures of pot holes, sluice pipes, and signs from Lower Podunk Road were present and discussed. The replacement signs are already here and the crew will be working the road as soon as possible. The regular monthly meeting of the Harford Township Supervisors was called to order at 7:00 PM in the township office by Chairman Terry VanGorden. Supervisors Furney and Foltz were present. Visitors were Dorothy Hagenbuch, Ted Brewster, Hollis & Paulette Adams, Doug Phelps, and Pat Farrell. Minutes of the May 10th meeting were accepted as printed on a motion by Foltz and second by Furney. So carried three yes votes. The bills list was approved as presented on a motion by Foltz and second by Furney. So carried by three yes votes. The treasurer’s report was reviewed and filed by audit. Richardson Rd. project – We have received a time extension until November 30, 2011, in hopes that the water level will go down. School St. project: There were no bidders for the paving in the first advertising. County Housing will again place a bid request in the paper. The noise meter has been purchased and received. Jeff Kyle, our agent for DGK Insurance, has sent us information concerning fire company members that participate in fund raising events. In order for those members the Board must authorize their coverage under the workers compensation insurance. After a discussion, it was decided to send the sample ordinance that Kyle provided to Attorney Hailstone for his review and comments. Clean up week is scheduled for next week. VanGorden feels that by using the full crew that the cleanup can be done in a shorter time. Next year we will advise to the public that we can no longer accept TVs and computers. The equipment radios, etc. and shop base have been gone over. Purosky & Tuckerman made the necessary adjustments and we now have better radio communication. The proper temperature gauge for the roller needs to be found and purchased. The sickle bar mower is again in need of repair. The boom mower’s use was discussed regarding the clutch pressure and the unbearable heat in the cab. Further information will be obtained. The crew is working section II, ditches have been cleaned, and now material is being spread and the Tingley St. and Orphan School Rd. are being worked. David Hoadley has inspected the heater and wiring situation at the plant. He will purchase a new heater, fan louvers, and do other repairs that are necessary. Our ordinance #6 will be sent to Attorney Hailstone for review regarding the collapsed buildings in the area that Foltz would like removed. The Auditors recommendations were again discussed. No further action was taken. Hol Adams commented that the news coverage of Harford Township is always negative and made to appear that nothing good happens in the Township. Comments about the road conditions are a constant issue. He further stated that residents need to understand that the heavy commercial truck traffic on our township roads is far greater that in the past. Stone trucks use township roads to bypass weight limits posted on state roads now and our roads were never used in this way before. Township crews work hard to keep up with the road work. Foltz called for a brief executive session immediately following this meeting for a personnel matter. The regular meeting of the Harford Township Supervisors was called to order at 7:00 PM in the township office by Chairman Terry VanGorden. Supervisors Foltz and Furney were present as well as visitors – Ted Brewster, Fred Grasso, Wayne Frederici, Ken Gallinger, Maureen Warren, Pat Farnelli, Doug Phelps, Elissa Muller. The minutes of April 12, 2011, were accepted as printed on a motion by Foltz and a second by Furney. Motion carried by three yes votes. The bill list was reviewed and approved as presented on motion by Foltz and second by Furney. So carried three yes votes. Treasurer’s report was filed for audit. The bids that were opened last month were ready for awarding. The one bid received for bio-diesel fuel was from Mirabito Energy Products at a fluctuating price with the OPIS average-Harrisburg published on Monday of the week of delivery. Furney made the motion to accept Mirabito’s bid and Foltz seconded. So carried by three yes votes. For the dust control oils, VanGorden made a motion to accept the bid of Asphalt Paving @ $1.34, also accept Suit Kote’s bid of $1.375 to ensure service as we need it. Furney made a second and motion carried by three yes votes. The one bid from Brown Farm Enterprises for black cinders at a quote of $14.50 per yard for fine and $18.25 per yard for course materials was accepted on a motion by VanGorden and seconded by Foltz. So carried by three yes votes. Noise meter - Foltz has found a meter that meets the specifications of our ordinance and all requirements. The kit costs $409.00 plus freight. He made a motion to purchase the meter he has indicated from Fortronic Corp. VanGorden seconded. Foltz asked VanGorden to order this meter as time permits. Motion carried by three yes votes. Southwestern Energy Road Agreement - The Supervisors will add an addendum to the agreement received from Southwestern to read “ Southwestern Energy will take responsibility for winter plowing and cindering on White Road, Houlihan Road and Still Hill Road is they have winter activity involving these roads”. Foltz made a motion accept the road agreement with Southwestern Energy as printed with the addition. Furney made a second and motion carried by three yes votes. School St. paving project - The Supervisors met with Bobbi Jo Turner from County Housing and Development to review the specifications for the project. She will do the advertising for bidding and should be in the paper this coming week. Richardson Road project - The road has been closed for work to be done on the hill section so when the project gets underway the residents have a way out. Material is being hauled to the hill section, a pipe will be replaced and the material will be leveled with a bulldozer. All material being used is what we have had in the yard from the by-pass in Harford a few years ago. Stearns Road - DEP has issued an emergency permit for us to install two 24” pipes side by side in the emergency spillway as a temporary set up. It has also been brought to our attention that the dam was last inspection in 2008 and had no noticeable concerns with the dam or outflow. An Assessment Permit for James Jones for a garage was reviewed and accepted with no objections. Clean up days were discussed and set for the week of June 20th. Everyone must be ready on that Monday as we cannot make return trips this year. Furney proposed that the road work continue and that Adams, Frederici and Furney handle the clean up. The cost per load will remain at $50.00 as last year and tires extra as usual. Tyler Lake Road was again blocked and Rote-Rooter had to be called in to help. The material was sent to a lab for analysis. It reported to be compost material and not waste. We may have to go door to door to question residents as to what is being put in the sewer lines. Also heavy rain still is causing extra flow to the plant. VanGorden reported that with the Richardson and Stearns Roads being closed and the heavy rains this spring there is a lot a work out there to do. It was discussed whether to keep all the crew working on the same project or the split them up and work in different areas as needed. No definite plan was made. Hol Adams will be brought in as needed. It is the opinion of the crew that once the road work is started that it should be done in a circle rather that running around the township to different areas. This will save wear and tear on equipment especially with the roller. Several items that were discussed at the Supervisor’s work session of April 26th were reviewed. The website is in the making and suggestions are being passed on to the webmaster, Dave Oakley. Foltz brought the matter of a time clock to the Board and made a motion to purchase on for proper documentation for time worked. Hearing no second the motion died. Normal office hours will be Monday, Wednesday and Thursday from 10 to 3. The hours will be posted on the website. Chairman Terry VanGorden called to regular monthly meeting of the Harford Township Supervisors to order at 7:00 PM in the township office. Supervisors Furney and Foltz were present. Visitors were Ted Brewster, Maureen Warren, Dave Sansky, Alice Deutsch, Connie Breese, Joseph Colletti, Doug Phelps, Linda Bonham, Bob DeLuca, and Pat Farnelli. The minutes of March 8, 2011, were approved as printed on a motion by Foltz and second by Furney. So carried by three yes votes. The bill list and treasurer’s report of March 8th were presented. Last month’s information was unable to be printed due to the failure of the printer. The March bill list were accepted as presented on a motion by Foltz and second by Furney. So carried by three yes votes. The March treasurer’s report was reviewed and filed for audit. April’s bill list was reviewed and accepted on a motion by Furney and second by VanGorden. Motion carried by two yes votes. Foltz voting no. April’s treasurer’s report was filed. OLD BUSINESS: Township website - We have our domain name now –www.harfordtwp.org – and are working with a webmaster in setting up our website. NEW BUSINESS: 2010 Township Auditor’s report was read into record by Connie Breese, Secretary of the Board of Auditors. A copy is attached to the recorded minutes. The Board recognized Alice Deutsch, representative of Friends of the Viaduct Valley Way Scenic Byway for her presentation. The group is seeking financial and volunteer support from individuals, businesses, community groups, and municipalities and is asking for our support. We will take this under consideration when the budget for 2012 is prepared. Foltz made a motion to award the bid from Eastern Industries and VanGorden made a second. Motion carried by three yes votes. 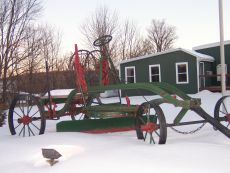 Brown Farms Enterprises were the only bidder for black cinders. Their price is $14.50/yard for fine and $18.25/yard for course which is state certified. Award for cinders was tabled. Awarding for dust oil was tabled. Bio-diesel fuel bid for the vehicles was received from Mirabilto Energy Products at a fluctuating prices of $3.6310 and for kerosene $3.9137 per gallon. Award was tabled. We received one quote for the lawn care from DNR (Randy Ball). For the township area $25.00 and the sewer plant $35.00. Foltz motioned to award DNR at these rates for the lawn care as needed. VanGorden made a second and motion carried by three yes votes. ROAD REPORT: VanGorden reported that the crew is working on pot holes. Hopefully when the roller is repaired yearly road work can get started. He plans to work one section at a time this year and not bounce around. With the cost of the fuel he feels it to be in the best interest of the township.